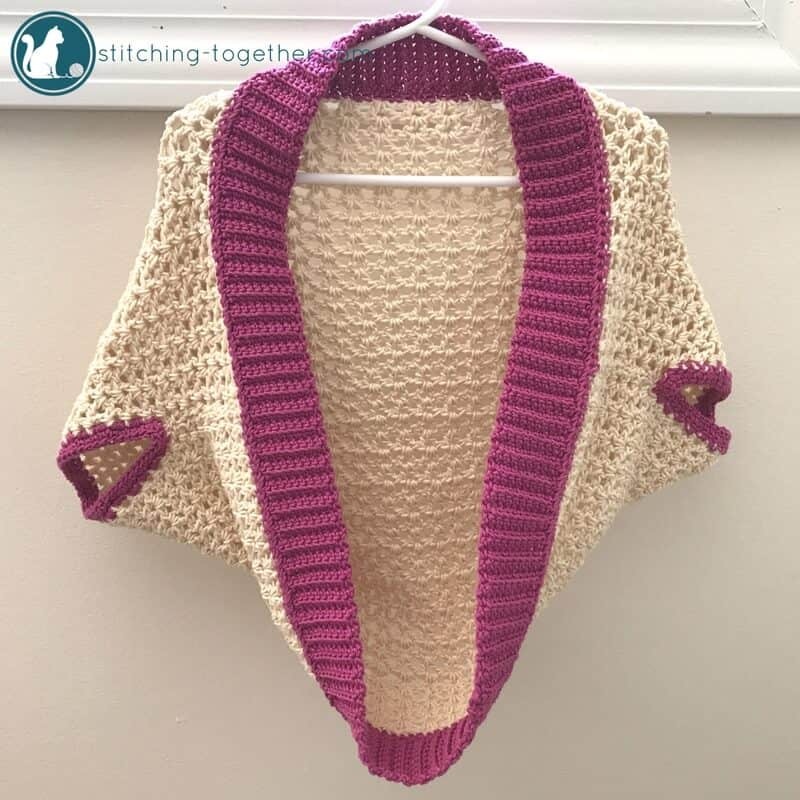 Free pattern for an adorable Crochet Toddler Cocoon Shrug. Its as easy as making a large rectangle and cleverly sewing it together. Add some ribbing and you have a beautiful garment! Keep scrolling for the full pattern instructions. Have you ever tried to photograph a toddler? I think people who are professional photographers, especially those working with kids, are some sort of magical! My almost 3-year-old is generally very willing and eager to help, but put her in the toddler cocoon shrug and ask her to pose and all sorts of shenanigans break lose. It doesn’t help that I think she is magical too. I kept having to remind myself that I was shooting the shrug and not the adorable little creature wearing it. One thing you cannot tell from the photos, is how amazing the finished shrug feels. I need to take a minute to rave about Lion Brand 24/7 cotton. The cotton is so smooth and shiny and it drapes beautifully! It was easy to work with and it looks professional – I don’t know another word for it. I’m (obviously) all about handmade/homemade but it doesn’t LOOK handmade (in the unfortunate sense of that word which is fine for macaroni necklaces but not so great for clothing). Maybe we need to come up with another word! Moving on…. I hope you enjoy the pattern. Please share it! Pinning to your boards is a super easy way to come back and find this pattern later. You can also sign up for my email list and I’ll let you know when new patterns are released. Purchase an ad-free printable PDF of this pattern! The main body of the shrug is made with an open v-stitch. It is super easy to get a nice rhythm going and the body works up quickly. The armholes are lined with two rows of scs in a contrasting color. Instead of crocheting the ribbing as a separate piece and then sewing on in the end, you join it to the body as you go, which leaves less room for error in trying sew a long strip to the body. Chain 88 (multiples of 3+1) turn. Row 1: dc in 4 ch from hook (ch counts as dc), *skip 2 chs, (dc, ch 1, dc) in next ch; *Repeat across, turn. Row 2: Ch 3, dc in ch 1 sp, *(dc, ch 1, dc) in each ch 1 sp; * Repeat across, turn. Fold rectangle lengthwise. Sew sides together leaving about a 4-inch opening. Join rose color with a slip stitch anywhere along the armhole. Sc around the armhole putting 2 scs in each space. Join to first sl st with sl st. Ch 1, sc in each sc. Join with sl st. Bind off and sew in ends. Repeat with 2nd arm hole. Row 1: ch 1, sc in 2nd ch from hook, sc in each ch. Join with slst to main body. Row 2: sc in the back loop of each sc. turn. Repeat rows 2 and 3 working in the back loops around the entire outer edge of the main body. Sew the seam together. Did you also notice that Lion Brand 24/7 Cotton yarn can be machine washed and dried? Run and get some TODAY and make this Toddler Cocoon Shrug! i HAVE 3 NEW GRAND DAUGHTERS …ALL,BORN WITHIN 3 WEEKS OF EACH OTHER , LAST CHRISTMAS, SO I AM MAKING THEM ONE EACH, BUT IN 3 DIFFERENT COLOURS SO THEY’RE NOT MISKTAKEN FOR BEING TRIPLETS, WHEN THEIR MUMS [ WHO ARE SISTERS] HAVE THEM ALL OUT FOR A WALK IN THEIR PRAMS! !…… i can/’t wait to make them… it looks a dainty pattern for little girls to wear. Many thanks for sharing it with your readers. I am sure they will love them and congrats on your sweet granddaughters! Hi Megan! I don’t have a PDF yet, but I can work on getting one put together! I agree that it is easier to have a print out with a toddler. Mine still manages to run away with my yarn and patterns so it is always a circus no matter what! This is so cool for kids. I’m older without small kids. Is there an adult pattern, possibly? I would like this for myself. I’ve wanted to make one for myself too but I haven’t gotten to it yet! To measure for this I measured elbow to elbow on my daughter and base of the neck down past her rear. Since it is a rectangle I think it will be easy to adjust the size! That’s a really good question and I was thinking about that very thing today! My daughter is just moving into size 3T and this will still fit her for awhile HOWEVER, I do wish I had made it a bit longer. It fits loosely anyway so it is really forgiving. If you are making it for 2 and under, I’d stick with the current size. 3 and older i’d lengthen it. Hope that helps!!! Thank you for this gorgeous and easy to make pattern. I was able to whip it up in a few hours as a gift for my friends daughter.